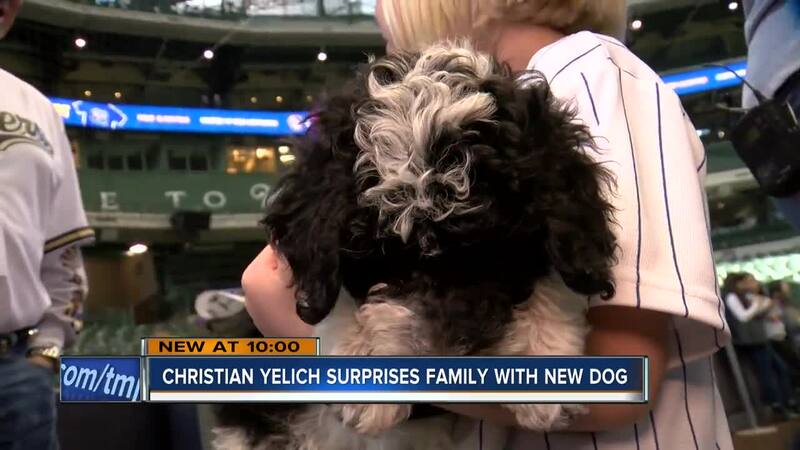 MILWAUKEE — A sign a Muskego family thought would be a good way to get Christian Yelich’s attention actually got them a new dog. It was hand delivered by the Milwaukee Brewer during a batting practice surprise. The Labodda family brought their little girls to Miller Park, telling them they were going to see a game. “They are here for a baseball game, that’s it,” their mom, Jessica Labodda, said. The sign Lola, 6, held up that caught Christian Yelich's attention. But that is not what Lola, 6, and Lily, 4, were really at the stadium to do. Though their dad said he would follow through, so far they have not gotten a puppy. Or that’s what the girls think. Their parents picked out a puppy a few weeks ago, but Christian Yelich asked if he could bring it to them. “It’s a whole family surprise,” dad Michael Labodda said. So while the girls watched baseballs fly, Yelich snuck out of the dugout carrying their puppy. Congrats! What are you going to name him? Might we suggest Yeli? “I brought you guys a present,” Yelich said, holding their dog. “Awww, thank you,” Jessica said. And they already had the name picked out. “Yeli,” said Jessica for her daughters who were too shy to tell the reporters who gathered to watch. The Labaddo family poses with Brewers Christian Yelich and their new puppy. The dog is even more special to the family because they hope to train him to detect when Lola’s blood sugar is too low. She has type-1 diabetes. “This dog can be trained to help my daughter survivor for the rest of her life. There is really no words for it. And for the Brewers to even allow this is just unbelievable,” Michael said. The family did not sta for the game because they wanted to get their new puppy home. They hope to start training him to detect low blood sugar in Lola in the next few weeks.